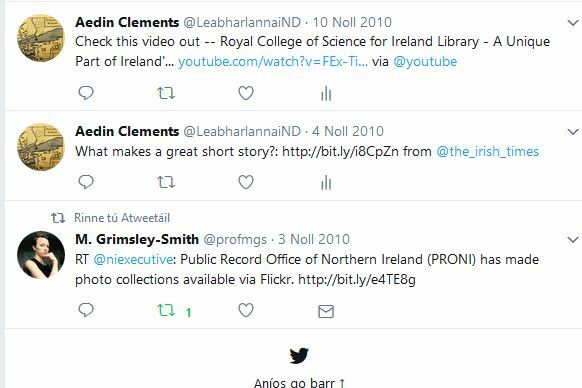 When Dr. Melinda Grimsley-Smith was a PhD student at Notre Dame, she convinced me that it would be a good librarianly service to open a Twitter account and to routinely re-tweet posts that might interest graduate students. She was excited about archives, and she was enthusiastic about sharing information about collections and about exciting new projects. And now I wonder if Twitter-cataloguing could be the answer to my question about blogs. Librarians organize information of all kinds,helping people sort through thousands of materials to identify information, books, journals or websites. We archive websites and catalog online publications. We find ways to make our information available online. But blogs seem to belong to a category that people discover either by serendipity or by word of mouth. The library cataloguedoesn’t seem appropriate for the informal format of the blog, so why not see how the social media can be used? On Twitter, I found an Irish Blogs hashtag, but this does not address my needs, which are to tag blogs interesting to those with an academic interest in Irish studies, e.g. scholarly or newsy articles on Irish history, literature, politics, music, art, theatre etc. I aim to curate, so that blogs included in my lists are up to date and to select in the same way as I would a journal or magazine subscription for the library. So my hashtag will be #IrishStudiesBlogs. So I think I’ll start a new hashtag and call it Irish Studies Blogs. 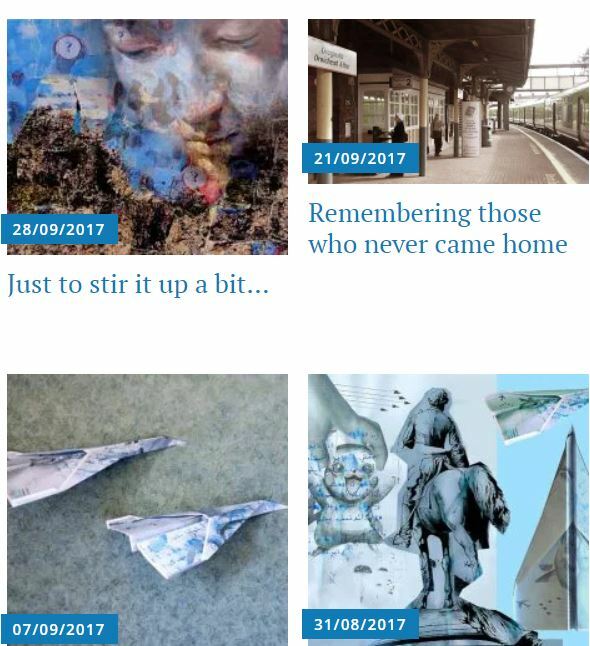 Blogs I want to catalogue include Mise Ciara, a great blog for Irish language students, Scéalta Ealaíne, shown above, the blog of artist Eoin Mac Lochlainn, Mairekennedybooks, on Irish historical bibliography, and writers’ blogs such as that of Lia Mills. Though I plan to include only blogs that are current, Deirdre Ní Chonghaile’s wonderful Amhráin Árann – Aran Songs begs to be listed. This three-year blog (2012-14) is a collection of essays on the people, music and songs of the Aran Islands. From biographies of writers and singers to an essay on the provenance of the piano in the house where Somerville and Ross stayed, the blog, written in Irish and in English, is an online publication that should be available to anyone studying Irish music, and so needs to be archived and catalogued. 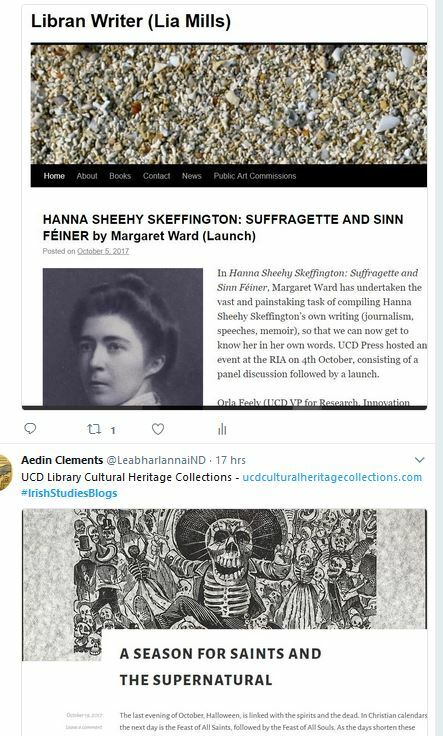 The blogs I am considering for my “Twitter Catalog” are listed below, and you can also see a preview of the Twitter-Catalogue for #IrishStudiesBlogs. Included here are blogs on various topics, but written in Irish and therefore good for Irish language students to have available. Hilary NY. 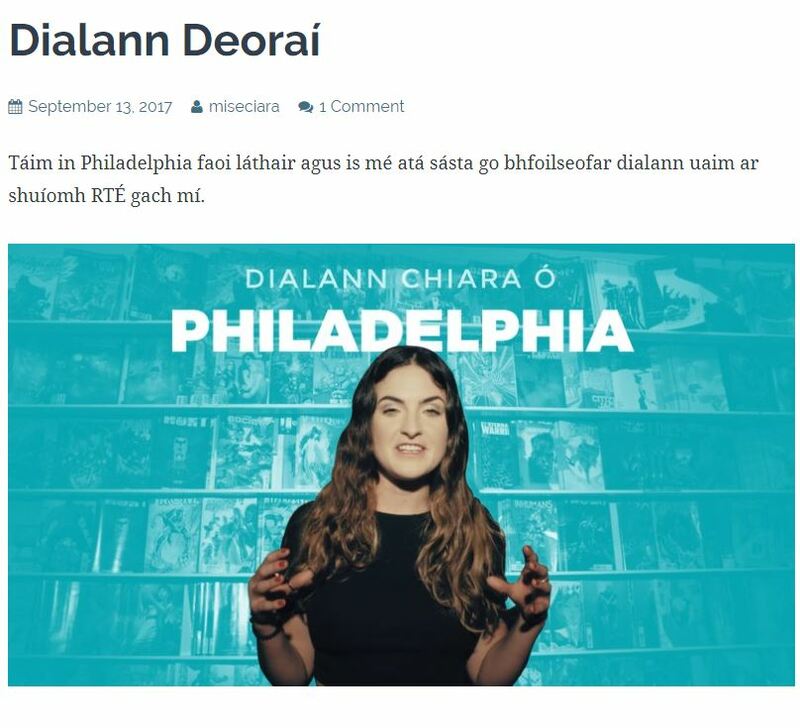 Meascra i nGaeilge ó Nua Eabhrach — Nó pé áit ina bhfuilim! S Mise Ciara, Seo mo Bhlag! I don’t know if this Twitter-catalogue idea will take, but if you come across a blog that would interest others in Irish studies, please add a tweet, or contact me at clements.22@nd.edu. Thanks! *Though bilingual now in the English languages of both sides of the Atlantic, I’ve never become comfortable with the u-less ‘catalog’.